The major advantage of the humeral interlocking nail is the use of the closed technique during insertion as well as the ability to lock the nail proximally and distally. M/DN Humeral Interlocking Nails range in diameters from <?xml:namespace prefix = st1 ns = "urn:schemas-microsoft-com:office:smarttags" />6mm to 13mm and lengths from 18cm to 30cm. Proper preoperative planning is essential to successful interlocked nailing of the humerus. A template or Ossimeter and an x-ray film of the unaffected extremity are necessary for determining canal size at the isthmus and for measuring the length of the humerus to aid in determining nail length. Harris/Galante Bulb-tipped Guide Wires (Sounds), available in diameters from 10mm-17mm, can be used as an alternate technique to determine nail diameter and length. X-rays taken at a 36-inch distance from the x-ray source result in 10-15 percent magnification of bone. The M/DN Ossimeter has both an actual size scale and one that takes into account this magnification. It should be used routinely to determine nail diameter and length. 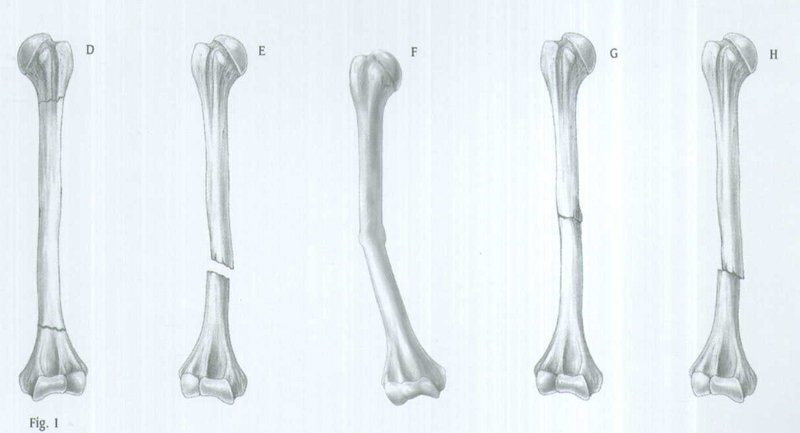 The proper length of the nail should extend from 5mm below the greater tuberosity to 2cm above the olecranon fossa. The diameter of the humeral nail should match the isthmus in the lateral x-ray to assure that there are no unusual anatomic variations. Place the patient in the "beach chair" position with the operative shoulder slightly over the edge of the operative table (Fig. 2). The back should be angled at 45 degrees. Flex the patient at the hip with the foot lowered 20 degrees. Slide the patient to the side of the table so that the shoulder overhangs the table at the level of the scapula. Place a small sandbag beneath the shoulder for elevation. Place the image intensifier above the arm so that, with the arm abducted, a clear anteroposterior and lateral view of the fracture can be obtained by rotating the image intensifier and the patient's arm. The proximal humerus should also be visible on the image intensifier. 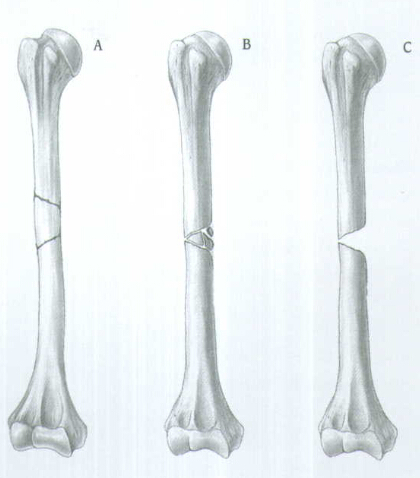 It is important to reduce the fracture before beginning the surgical procedure. Begin the incision at the anterolateral aspect of the shoulder at the level of the acromion and extend it about 3cm distally (Fig. 3). Carry the dissection sharply down through the skin and subcutaneous tissue to the border of the acromion. Continue to the lateral aspect of the acromion in its anterior third. Expose the edge of the acromion and split the deltoid. Adduct the arm across the chest to expose the greater tuberosity. Palpate the greater tuberosity and make an incision in the rotator cuff at the insertion of the rotator cuff longitudinally approximately 2cm. This should expose the superior aspect of the articular cartilage of the humerus and the insertion of the rotator cuff in the greater tuberosity. Place the Femoral or Tibial Awl at the junction of the articular cartilage and the greater tuberosity (Fig. 4). Check the position with A/P and lateral views. When the correct position is achieved, rotate the awl to create an entry portal for the Bulb-tipped Guide Wire. Attach the 3.0mm Bulb-tipped Guide Wire to the Wire-Grip T-Handle (Fig. 5) and tighten. To aid in manipulation, bend the tip of the guide wire at about a 10°-15° angle 2cm from the end (or use a pre-bent guide wire). Insert the guide wire through the entry hole and manipulate it down the proximal humerus. Advance it to the edge of the proximal aspect of the fracture site and use the C-arm to assure proper placement. Optional Technique: The 2.4mm bulb-tipped guide wire in 70cm length can be used as an alternative to the standard 3.0mm guide wire (100cm length). Position the arm to the side of the patient and place traction on the arm to align the humeral shaft. Manipulate the guide wire into the distal fragment under C-arm control (Fig. 6). Then advance the guide wire into the center of the epicondylar region of the humerus (Fig. 7). Remove the Wire-Grip T-Handle. Determine the proper nail length by placing a second guide wire of equal length at the point where the first guide wire enters the proximal humerus. The length of the wire that is not overlapping is the correct nail length required (Fig. 8). An alternative method is to place a clamp on the calibrated bulb-tipped Guide Wire at the point where the wire enters the proximal tibia and read the length from the calibration marks. Place the Skin Protector in the wound. Then place an intramedullary reamer over the guide wire and ream the humeral canal. Continue reaming in 1/2 millimeter increments until contact is made with the cortical wall. Ream the humeral canal an additional 1mm larger. 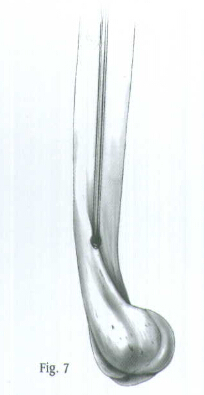 The diameter of the humeral nail selected should be 1mm less than the largest reamer used. Humeral nails from 6mm to 10mm have an 11mm proximal body. Overream to 12mm for these nails (approximately 50mm in length). Caution: In a comminuted shaft fracture, do not ream across the area of comminution. Ream only in the solid aspect of the shaft. Avoid reaming when there is injury to the radial nerve. When the reaming is complete and the final measurements are made, insert the plastic Exchange Tube over the Bulb-tipped Guide Wire. 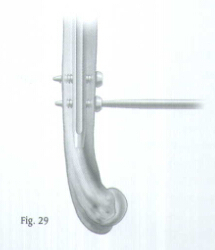 Remove the Bulb-tipped Guide Wire and insert the 2.4mm Humeral Smooth Guide Wire (Fig. 9). Note: 6mm and 7mm nails are solid and, therefore, the guide wire must be removed before nail insertion. You must use a 2.4mm Guide Wire with all Humeral Nails. Attach the selected nail to the Humeral Proximal Guide, making sure that the arrows align. A keyway in the proximal end of the nail will help ensure proper alignment (Fig. 10). 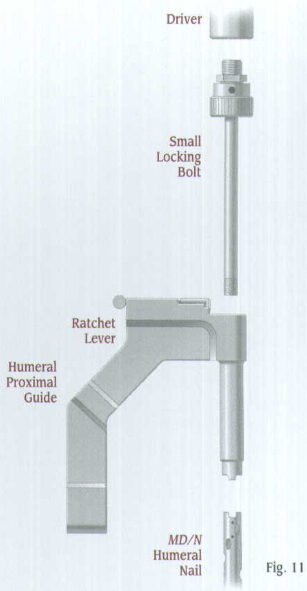 Lift and turn the ratchet lever 90 degrees to open the ratchet mechanism of the Humeral Proximal Guide. Insert the locking Bolt through the barrel of the guide (Fig. 11). Lift and turn the ratchet lever 90 degrees to close the ratchet mechanism, and use the Pin Wrench to tighten the Locking Bolt into the proximal end of the nail. The ratchet mechanism will prevent the bolt from loosening during insertion of the nail. 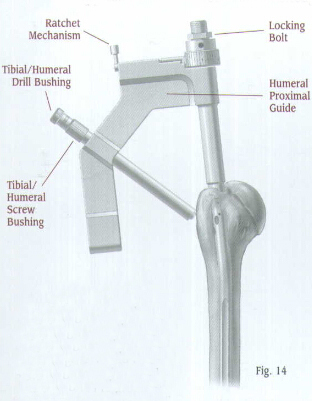 Note: If the ratchet mechanism of the Humeral Proximal Guide does not operate freely, it may be necessary to disassemble, clean, and reassemble the mechanism. If the ratchet mechanism becomes inoperative, it may be removed. The assembly will still function; however, the Locking Bolt may loosen during the procedure. Note: All humeral nails use 4.2 or 4.5mm screws proximally which require a 3.7mm Drill (Color Code: Blue). Verify proper alignment by inserting the 8.0mm Tibial/Humeral Screw Bushing, the 3.7mm Tibial/Humeral Drill Bushing (Color Code: Blue),and the 3.7mm Drill (Color Code : Blue) (Table II) into the appropriate hole of the Humeral Proximal Guide. When the device is properly aligned, the drill will pass through one of the proximal holes and will not contact the nail. Screw the Threaded Driver or Slaphammer into position on the Locking Bolt. Insert the nail over the 2.4mm Smooth Guide Wire and into the humerus. Begin seating the nail using gentle impaction with the mallet (Fig. 12). The nail must advance with each blow of the mallet. If it does not, remove the nail and ream again. While impacting the nail, use the Humeral Proximal Guide to maintain the proper rotation. Be careful when crossing the fracture site. Visualize the fracture in two planes with image intensification to assure proper passage of he nail into the distal fragment (Fig. 13). Reduce the force of impaction as the proximal end of the nail approaches the humeral head. Nail should be inserted 5mm below subchondral bone. When the nail is fully seated, REMOVE THE GUIDE WIRE so it does not get trapped in the bone. Remember, it might be concealed inside the driver of Slaphammer. The M/DN Humeral Nail has three oblique locking holes proximally. Insert the Tibial/Humeral Screw Bushing through the hole of the Humeral Proximal Guide until contact is made with the skin. Insert the 3.7mm Tibial/Humeral Drill Bushing (Color Code: Blue), which screws into the screw bushing. Make a small stab wound, then advance the nested bushings through the incision until they contact the bone (Fig. 14). Insert the 3.7mm Drill (Color Code:Blue). Drill through both cortices (Fig. 15). The drill is calibrated to measure the hole depth and determine the appropriate screw length. If desired, the Proximal Screw Depth Gauge can also be used to determine the screw length (Fig. 16). Select an appropriate length screw to ensure that the screw will engage the far cortex. Remove the drill and drill bushing. Use the T-Handle Screwdriver to insert the appropriate 4.2 or 4.5mm screw (Color Code: Blue) to the correct hash mark (Fig. 17). Insert the screw until the "Tib/Hum" reference line is flush with the bushing. Be careful not to drive the head of the screw through the lateral aspect of the humerus. Remove the T-Handle Screwdriver and Tibial/humeral Screw Bushing. For more proximal fractures, additional oblique screws may be used. 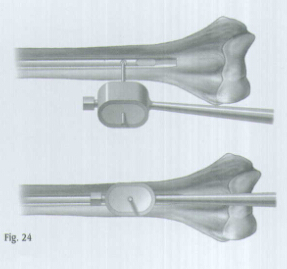 Attach the humeral Oblique Hole Adaptor to the Humeral Proximal Guide (Fig. 18). Secure the adaptor with a set screw, and tighten the screw with the Pin Wrench. The adaptor has two holes. One hole is for anterolateral to posteromedical screw insertion. The other hole is for posterolateral to anteromedial screw insertion. Insert the 8.0mm Tibial/Humeral Screw Bushing through the appropriate hole of the Humeral Oblique Hole Adaptor until contact is made with the skin. Insert the 3.7mm Drill (Color Code: Blue). Drill through both cortices (Fig. 19). Determine the screw length by using the calibrations on the drill. Select a screw 5mm shorter than measured to avoid penetration of the head. Remove the drill and drill bushing. Use the T-Handle Screwdriver to insert the appropriate length 4.2 or 4.5mm screw (Color Code: Blue) until the reference line marked "Tib/Hum" is flush with the bushing (Fig. 20). Then use the C-arm to check the position of the screw and tighten it appropriately. 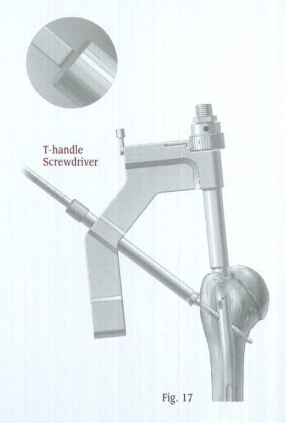 Remove the T-handle Screwdriver and Tibial/Humeral Screw Bushing. If an additional proximal screw will be used, repeat the procedure. Take A/P and lateral C-arm views to check for correct positioning. Disengage the ratchet mechanism, then loosen and remove the Locking Bolt and Humeral proximal Guide. Be sure that the humerus has not been distracted during nail insertion and proximal locking. Before locking the nail distally, tap on the elbow or the insertion device to ensure impaction. Note: 4.2 or 4.5mm screws (Color Code: Blue) are used proximally for all Humeral Nails. Insert the Humeral Locking Nail Cap to ensure secure fixation with the proximal oblique screw. The distal locking screws are inserted with a free-hand technique using the Free-Hand Targeting Device. The inferior distal hole of the M/DN Humeral Nail is an anteroposterior dynamic slot to help achieve dynamization. The second hole is for static locking. If static locking is preferred, but there is a potential need for later dynamization, insert screws in both anteroposterior locking holes. The locking screw in the static hole can then be removed to achieve later dynamization. Note: 6mm nails are not locked distally. 7mm and 8mm nails use 3.7mm screws distally which require a 3.2mm Drill or Trocar (Color Code: Yellow). 9mm-13mm nails use 4.2 or 4.5mm screws distally which require a 3.7mm Drill or Trocar (Color Code: Blue). Insert the appropriate Trocar into the Targeting Device and finger tighten (Fig. 21). It is very important to properly place the C-arm. When using the distal static hole, position the C-are so the locking hole of the nail appears perfectly round on the monitor (Fig. 22). When using the distal dynamic slot, position the C-arm so the slot appears in such a way that reveals its greatest width. Make a 2cm incision over the appropriate locking hole. Insert the Trocar until it contacts the humerus. Use the C-arm view to center the tip of the Trocar over the locking hole (Fig. 23). Then use the C-arm to align the Trocar in the proper axis (Fig. 24). Use a small mallet to drive the Trocar into the humerus and through the hole in the nail in line with the x-ray beam. Do not penetrate the opposite cortex. Verify Trocar placement in both the A/P and lateral planes using image intensification (Fig. 25). Remove the Trocar. 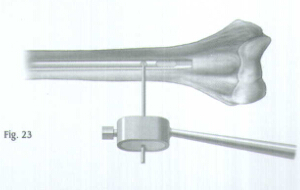 The path of the Trocar in the bone acts as a pilot hole for the drill. 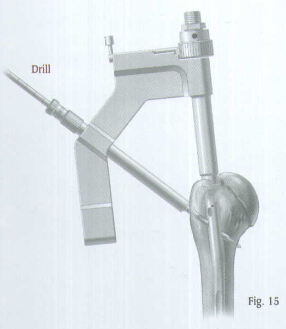 Use the appropriate drill to drill a hole through the guide hole left by the Trocar (Fig. 26). Drill through the near cortex. Remove the power drill, leaving the drill bit in the bone. Use image intensification to be sure that the drill is through the inferior aspect of the dynamic slot. Then advance the drill through the posterior cortex. 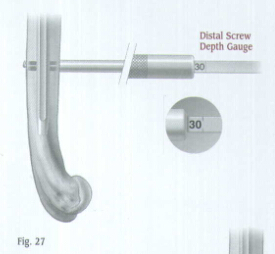 Use the Distal Screw Depth Gauge to select the proper length screw (Fig. 27). Read the length directly off the gauge. Select an appropriate length screw to ensure the s crew engages the far cortex. 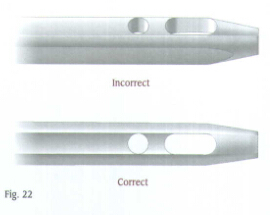 Use the Distal Screwdriver to insert the appropriate screw (Fig. 28). Then check the position of the screw in the anteroposterior and lateral planes.Insert the second distal locking screw in the same manner (Fig. 29). Check the position of both screws with the C-arm in the A/P and lateral planes. Bushings are available that can also be used with the Freehand Targeting Device. A separate radiolucent Bushing Insert is available to accommodate the bushings. After irrigating the wounds, close the rotator cuff with tendon sutures after debridement of frayed edges. Close the subcutaneous tissue and skin in a routine fashion and apply a soft, sterile compression dressing. Early range of motion of the shoulder and elbow is encouraged if stable fixation is achieved. 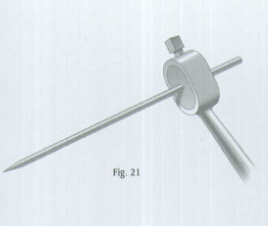 Should extraction of the nail become necessary, attach the Threaded Extraction Adaptor to the end of the nail and use the Slaphammer to extract the nail after all interlocking screws have been removed (Fig. 30). The cannulated Locking Bolt should not be used for nail removal. Extraction of the nail should be accomplished by using the Threaded Extraction Adaptor. Note: Please refer to the package insert for complete product information, including contraindications, warnings, precautions, and adverse events.